The 30.4 metre (100’) sailing yacht Raja Laut is nearing the end of an extensive refit and will be available for charter from October 2015 to April 2016 in the Andaman Sea. 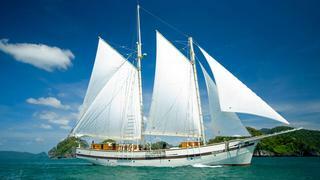 Built in ironwood using traditional methods in northeast Borneo, she is a classic gaff-rigged schooner delivered in 2006 and ideal for exploring the 800 remote, exotic islands of the Mergui archipelago in the Andaman Sea. Her owner, Georges Carraz, is a keen sailor who developed a close knowledge of regional boating techniques after 30 years in Southeast Asia. The refit saw her cabins and bathrooms all upgraded, along with her engine room, soundproofing, electrical systems, rigging and sails, bringing her back to fresh life. Her interior in rich timbers and colourful textiles offers accommodation for 12 guests in six cabins consisting of three doubles and three twins, all with air conditioning and en suite bathroom facilities. Water toys include a tender, snorkeling gear, scuba diving equipment, kayaks, fishing tackle and an assortment of towables including water skis. After April 2016 Raja Laut will relocate for the summer season to the Komodo National Park, famed for its unique Komodo dragons and outstanding scenic beauty. Private charter costs from €4,500 per night for up to 12 guests while Indonesia Yacht Charters offers a 5-night Komodo National Park package from €1,875 per person based on 12 guests travelling, including accommodation onboard Raja Laut on a full board basis, excluding excursions, diving and transfers.